Kosciuszko Mound, Krakow…ever heard of it? While we were staying in Krakow, Our friends Adriana and Thomas thought it would be a great idea to take us to Kosciuszko Mound. Kosciusko Mound is one of the many attractions in Krakow Poland. The views over Krakow from here are amazing. They also thought the Australian connection would be great as well for us. Kosciuszko Mound inspired Count Paul Strzelecki, an Australian/Polish explorer, to name the highest mountain in Australia Mount Kosciuszko. Strzelecki named the mountain because of its perceived resemblance to the Kosciuszko Mound in Kraków. kopiec kościuszki is what the Polish call it. 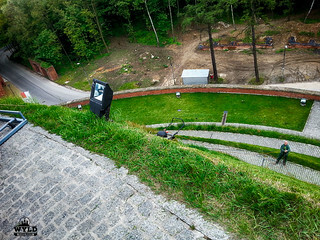 Just out of Krakow the mound is located on Blessed Bronisława Hill, also known as Sikornik and it is situated in the western part of Kraków’s Zwierzyniec District. The drive up to the mound is beautiful. As you go through the city the buildings get less and less when you eventually end up in a beautiful wooded area with the mound looming right before you. We parked the car and took a small walk to the entry gate. There was a small information plaque that told us that the mound was started in 1820 and built by hand till it reached a height of 35.5 meters high. The mound was mainly used as a lookout throughout its life in times of conflict. If you look closely you can see the mower! The two men had a lawnmower attached to a rope. One man stood up on the higher level of the mound while the other one was on the lower. They used the rope as like pulley and between them the lower the mower, slowly! Then they would turn it around line it up and pull it up. Ingenious! I think they thought I was crazy standing there watching them and taking photo’s but I thought there is no way I am going home without some proof of this one! Krakow hop on hop off bus. The Krakow hop on hop off bus stops at the Kosciuszko mound for your convenience. See the sights of Krakow at your own pace from the top deck of a double-decker, hop-on-hop-off sightseeing bus. Choose a 24-hour or 48-hour ticket to acquaint yourself with the city, and marvel at monuments such as the Cloth Hall and Wawel Castle. When I finally left the mowers alone and made my way to the top I was not disappointed with the view! The walk up was steep and there were no rails on the side of the path! Again, that would just not happen in Australia! I think if there were rails it would take away something from the mound so we just warned the child that has to run everywhere this was probably time to slow down a little! At the top of the mound is a granite boulder that was brought in from the Tatra Mountains and engraved with the word “Kościuszce”. The girls thought it was huge! After walking to the top of the mound, viewing Krakow and its surrounds a visit to the permanent exhibition onsite is a must. You see the mound is surrounded by an old fortification a one-of-a-kind citadel. This fortification was designed strictly for defence. This is one of the oldest remaining parts of Krakow fortress. The fortress and this remaining section were erected in 1850-1856. The mound was once protected by 60 cannons and 732 soldiers. The exhibition located in the old fortifications is ongoing and titled “The Fortress and the City of Krakow – 1846-1918”. The exhibition has great information on all things Polish…even a life-size statue of Pope John Paul II. It does mainly focus on Kosciuszko himself and what he achieved in life but it is great to wander around all the exhibits in there. We thought all the information on the Mound over its lifetime was great too. I also enjoyed reading about the issues that The Mound has had and what the committee has done to ensure that it is preserved. As we know many things that are getting on in age do need restoration works and upgrades to ensure that they do not erode. Krakow Airport is served by two regular bus lines: 208 and 252 and a one-night line: 902. We hoped you enjoyed our article, please find 2 more articles from Wyld Family Travel for your reading enjoyment below. Just click on the image to be taken to the article. No, I’ve never heard of it but now you make me want to go visit there! What a beautiful view from the top, and the whole lawnmower process is fascinating. The Kosciuszko Mound is certainly ususual and I assumed it was man made as soon as I saw the picture. What a shame that it wasn’t a great view from the top. I visited Krakow ages ago. I cherish my memories about beautiful architecture… and slippery pavement (during my two days there drizzle never gave up). Looking at your photos, I see how much I missed because of the weather. As you might guess, under gray clouds with a sprinkle of water on your face Kosciuszko Mound looked slightly different. I do like the look of Krakow’s old town soaked in the rain on my photos, though, and it’s so much better to browse them sitting in a warm, dry room. I haven’t been to Krakow, but if I ever get to visit, I’ll definitely try to see this place. I think it’s unique! Ha I would not want to mow that lawn!! I love finding places for good views of the city, this mound looks perfect for that! Since I was maybe 10 or 11 I’ve always wanted to visit Krakow… which seemed a little odd to my parents since we’re not Polish. But the beloved head of our youth soccer league was from Krakow, and I just found him and his accent so charming an interesting. The Kosciuszko Mound definitely sounds like a place I want to add to my list for when I can finally visit Krakow! That’s a large mound!! Cool to look up at and to look down from eh? Love how green it is. Glad to see someone is taking care of it. I will definitely make sure to visit this place, when I am in Krakow next time. Sounds like a really amazing place!